The Madrid junior team won in the final of the Munich tournament and qualified for the final phase of Vitoria. Garuba had 22 points, 9 rebounds and 6 assists. 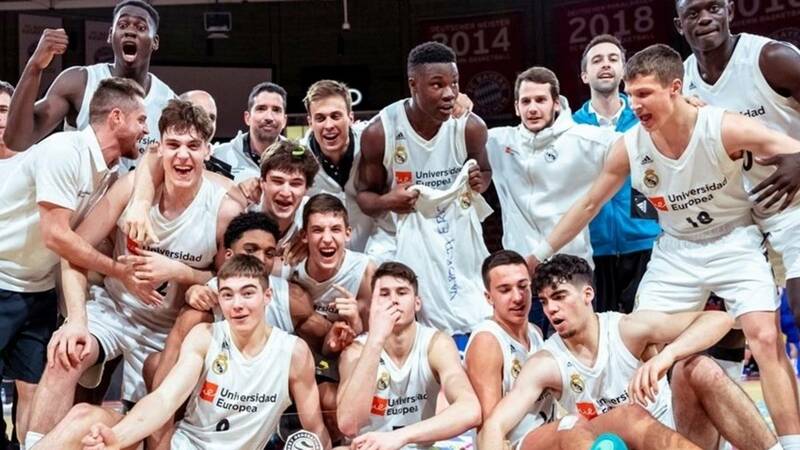 Real Madrid will fight in Vitoria for the title of European junior champion (born from 2001 onwards), in a final phase of eight teams to be held in parallel to the Final Four of the majors (May 17-19). The white team, trained by Mariano de Pablos, who managed to lead Estudiantes in the ACB, has won the ticket for the event after dominating the tournament in Munich (Adidas Next Generation), where this Sunday in the final Maccabi by 96-58. Great performance of the collective, much talent and physical superiority, and in particular of Usman Garuba, who at 16 years and 2.02 meters Laso has already debuted in the ACB. The pivot, born in Madrid and MVP of the tournament, acabó with 22 points (9 of 13 of two and 1 of 3 in triples), 9 rebounds and 6 assists for 32 of valuation in 27:39. Between him and the English Kareem Queeley braked Deni Avdija, the talented Israeli off-roader that this course has had a minute with the first team in the Euroleague. Avdija had averaged 26 points and 38 of valuation in the three previous meetings and in the final was 18 and 10 credits. The white defense reduced their numbers and led to more forced shots (7 of 15 of two and a very poor 1 of 11 of three) and losing five balls. The Madrid is the second classified for the phase final. Antes was achieved by the junior team of the Valencia, who reached the square a month ago in the tournament organized in L'Alqueria. In Vitoria there will also be the winner of 2018, the Lietuvos Rytas, and the winners of the two remaining qualifying tournaments, one in Kaunas and one in Belgrade. The eight teams will be completed with three invitations. Before defeating with solvency Maccabi, who held the guy in the first quarter (18-17) and did not get off the hook until the second half (43-32 at halftime), the whites had passed over German Rathiopharm Ulm (89-74), Panathinaikos (98-40) and Alba Berlin (111-60) . In addition to Garuba (16.5 points average in Munich, 7 rebounds , 3.8 assists, 1.3 steals and 1 stopper for 26.5 of valuation in just 19:49 in court), the center Amar Sylla has also been included in the ideal quintet of the championship. The Senegalese, a great intimidator of 2.06 and 17 years, has averaged 14.5 points, 7.8 sacks, 3 blocks and 23.8 points. His evolution is very positive. The list of highlights in Madrid is extensive. You can follow Mario Nakic, one of the pearls of the quarry (2.01 and 17 years), a forward of enormous potential (2.01 and 17 years) that has finished with 14 points per game. A lot of class for shooting and penetration, like the Croatian Boris Tisma, more irregular but also a year younger. Y can be continued by the guard-forward Queeley, decisive in the final in attack and defense (15 points, 7 rebounds, 2 assists and 20 assessment), and by the bases Jorge Mejías and the Slovenian Ziga Samar (7.8 passes of basket between both). Yy add to the rocky interior of Málaga Golden Dike, to the multipurpose Rubén López de la Torre (a mixture between Reyes and Deck) and the quality of the Italian Matteo Spagnolo, born in 2003, that is two years younger than most of its rivals. El Madrid will fight like this in May for a title he won in 2015 with Luka Doncic of great figure. He was only 16 years old and he was accompanied by the quintet De la Rúa, Yusta, Samba and Caté. In that group were also, among others, Rico, Barreiro and Dos Anjos. There is no other like Doncic, it is clear, but this Madrid is as powerful as that. And what is even more important, he can leave several players for the elite.